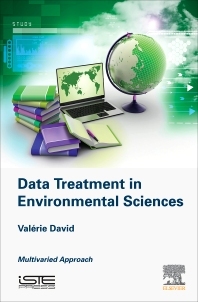 Data Treatment in Environmental Sciences presents the various methods used in the analysis of databases—obtained in the field or in a laboratory—by focusing on the most commonly used multivariate analyses in different disciplines of environmental sciences, from geochemistry to ecology. The book examines the principles, application conditions and implementation (in R software) of various analyses before interpreting them. The wide variety of analyses presented allows users to treat datasets, both large and small, which are often limited in terms of available processing techniques. The approach taken by the author details (i) the preparation of a dataset prior to analysis, in relation to the scientific strategy and objectives of the study, (ii) the preliminary treatment of datasets, (iii) the establishment of a structure of objects (stations/dates) or relevant variables (e.g. physicochemical, biological), and (iv) how to highlight the explanatory parameters of these structures (e.g. how the physico-chemistry influences the biological structure obtained). Valérie David is a lecturer and researcher at the University of Bordeaux in France. From 2007 to 2011 she was a lecturer at the University of La Rochelle. She is specialized in planktonic ecology and obtained her PhD in oceanography in 2006.